Robert and Melinda had a problem. Many would say it was a good problem. With Melinda’s recent retirement, she was now free to join Robert, an accountant who had retired a few years earlier. This wasn’t the problem. Melinda had always had a dream of owning a bed and breakfast, but property values at home, even through the economic near-collapse, were still very high, especially on the coast or near the mountains. Equally concerning was the current economic uncertainty facing many nations. Plus, Robert wasn’t looking for another full time job. He wanted to stay active, but also wanted to explore new hobbies. 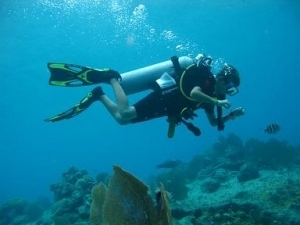 On a recent vacation, Bob finally got up the nerve to try scuba diving and he was hooked!! Could Robert and Melinda find a solution that would please them both? By chance, Melinda came across an article from botiquehotelnews.com that introduced a concept that neither she nor Robert had heard of before. Business people and retirees were building small but luxurious hotels or buying several condos in a building and were running them as a boutique hotel. Here, Melinda thought, is the answer for us both. As she dove headfirst into her research, she learned that many vacation travelers wanted more than a branded hotel room. They wanted space and they wanted to be spoiled. What she thought would really excite Robert was that these travelers were very willing to pay a significant premium to have the vacation they wanted. Melinda took her research to Robert. Robert, always the skeptical accountant, wasn’t convinced. Where would they find a property and what did they know about running a hotel, he asked? But, he was curious enough to start looking at real estate investment in Europe, their preferred location, and he didn’t like what he found. Most of the European Union was not performing well, especially in real estate. But, then Robert found a jewel. There were several small hotel properties for sale in Turkey. Robert had heard that Turkey was faring much better than most of Europe and was now allowing foreign real estate ownership. If they couldn’t find a small hotel, they could almost certainly buy a guest house in Turkey. And with its beautiful climate, perhaps if they couldn’t find a property on the coast, they could certainly find a boutique hotel property in the mountains surrounding Bodrum or Fethiye. As they dug deeper, a third option was forming. They could buy several condominiums in a wonderful development, preferably adjacent to each other and run a business within a business. Armed with their research and a sense of adventure, Robert and Melinda scheduled a trip to Turkey to tour to view multiple properties for sale in Turkey. The confidence in their idea was further bolstered when they were met at the airport by their real estate agent and guided to a beautiful boutique hotel similar to their hopes. Melinda was floored at the space and amenities available to them. The view of the beach was amazing and there was staff available for anything they might need. They even had a car and driver available whenever they needed it. The owners operated eight condos as a hotel. What Robert saw concerned him greatly. This looked an awful lot like a job to him. He was pleasantly surprised to find that the entire operation was run by a local property management company on behalf of the absentee owners. So, they took the plunge, purchasing a small hotel for sale in Bodrum. They chose to sell their home, knowing that they could stay with their grown children whenever they wanted. Robert tapped a golfing buddy who built a beautiful website that handled reservations and payments for the hotel and the worked with an Internet marketing firm to make sure that their property was being seen by the right travelers. In the early months, Melinda worked with the hotel staff, often found in the kitchen teaching the staff how to prepare and bake treats from home and Robert spent his time between diving trips keeping an eye on the finances. In the first 5 years, they were able to completely pay off the small mortgage and used their Turkish real estate as a home base while they explored Europe, often staying in boutique hotel properties where they learned new ideas they could use when they returned to their Bodrum property. Robert added dive trips to the amenities and had their Internet marketing firm focus on scuba divers and their families. Melinda and her staff host cooking classes where guests can learn how to prepare Turkish treats and wine tastings so guests can sample and purchase fine local and regional wines that are shipped and waiting when they return from their vacation.